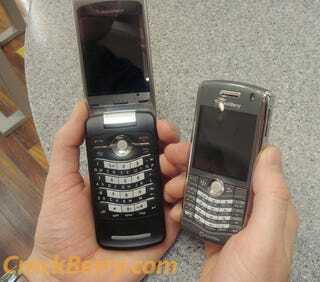 The kids over at CrackBerry got their hands on the new Blackberry Kickstart 8220-the first flip phone BlackBerry. And while they have yet to publish a complete review, CrackBerry definitely likes the hardware, claiming that RIM has not cheapened the build quality for its casual audience. But how does it match up to the BlackBerry Pearl? Pretty well, they claim. ...the KickStart has a lot going for it - bigger display, bigger/easier to type on keyboard and most important to some, OS version 4.6. I find the side by side keyboard shots to be almost comical - the KickStart's keyboard makes the Pearl's look like Mini Me in comparison... the KickStart is a more masculine SureType option in the BlackBerry family. I dunno though, the KickStart is thicker, too, and that SureType keyboard is still inexplicably slanted.